The Acer Liquid C1 might not catch the eye at first, but it is indeed different than most other smartphones as it features an Intel Atom processor inside. The Intel Atom Z2420 under the hood runs at 1.2GHz and it is a single-core chip. We have seen Intel do some big leaps in mobile recently, and while it is not yet on par with most ARM processors in terms of power efficiency Chipzilla is swiftly moving forward. 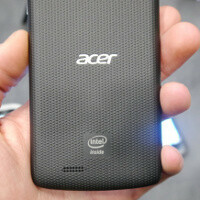 The Acer Liquid C1 on its part is a pretty generic handset if we don’t count its Intel Atom chip. It features a 4.3-inch qHD LCD display, 1GB RAM, and 4GB of internal storage that you can expand with microSD cards. The battery pack is 2,000mAh, enough to get you through the day. The Liquid C1 packs an 8-megapixel camera with auto-focus. In the hand it felt plasticky with the only thing that would stand out being its textured back allowing for a tighter grip. It is not too heavy at 140 grams, and not too thick either. Right now, Acer is planning to bring this mainly to Southeast Asia, with no plans for US availability. The processor, being single core, unbalances the whole device, except that it looks like a decent mid-range phone.